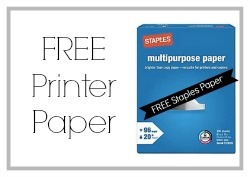 It’s time to stock up on some more FREE paper at Staples this week! Head over to the coupon page to print some great new in-store coupon, valid thru 4/26. Don’t miss out on this great paper deal, plus what better way to stock up on paper for printing coupons. Also, don’t forget that when you purchase (2) participating household products, including Bounty Basic Paper Towels, Charmin Basic Bathroom Tissue, Tide Pods or Gain Flings, you can get a FREE $5 Staples gift card by way of Easy Rebate! This is a fun promotion that can get you some great household deals, so go ahead and check out this Charmin Bathroom tissue deal. Staples Easy Rebates are nice because you are able to submit all the information needed online without having to mail in anything! Your rebate comes to you in a Visa gift card so can then spend the money anywhere. See more Office Supply Stores.